Sales at B&Q tumbled 8.8pc to ?828m in the three months to April, as freak weather from the "Beast from the East" battered the high street. Like-for-like sales, which strip out new shops, fell 9pc. A stronger performance from its sister brand Screwfix could not stop parent company Kingfisher recording a 3.7pc fall in total sales in the UK & Ireland, to ?1.2bn. Chief executive Veronique Laury said the adverse weather hampered the business in February and March but that sales had picked up in April and May. “It was a challenging start to the year with exceptionally harsh weather across Europe and weak UK consumer demand. This impacted footfall, especially sales of weather related categories," she said. “Market conditions continue to be mixed. The UK is uncertain, as demonstrated by recent weak retail sales data." Kingfisher, which runs businesses in Poland and Russia and operates Castorama and Brico Depot in France, is in the middle of a five-year plan to transform its buying functions and remove product duplication. Ms Laury called the French market "volatile" while Poland "continues to be supportive". Kingfisher’s total sales fell 1.2pc to ?2.8bn. On a like-for-like basis, sales fell 4pc across the board. Screwfix, which caters more for the trade customer, remained a bright spot for the company. Like-for-like sales climbed 3.6pc, while total sales lifted 9pc to ?395m on the back of 10 new stores. Excluding the impact of the weather, B&Q’s UK and Ireland sales were still around 3pc lower over the three month period. The DIY chain has been grappling with a double whammy of weak consumer confidence and increased competition. 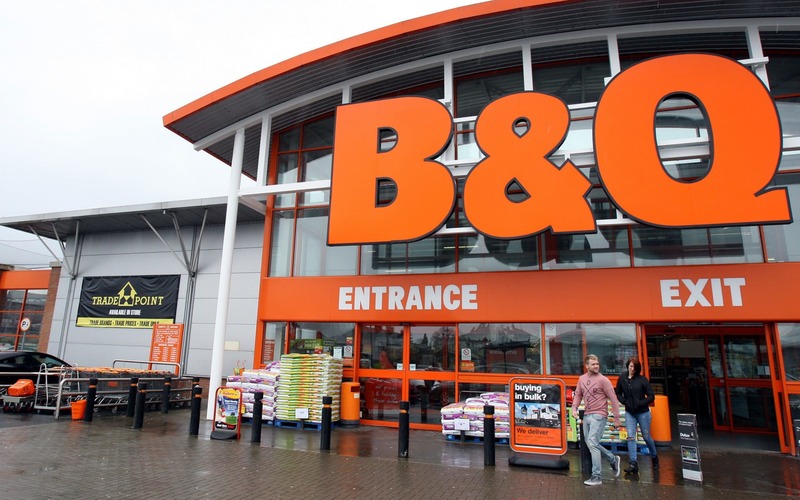 B&Q is also seeing market share stolen by fast-rising discount chains. Fiona Paton of GlobalData said chains like B&Q were struggling to cope with fast-rising discounters. She said: “[B&Q] is at risk of losing ground to discounters, especially B&M. Discounters’ collective market share in DIY & gardening is forecast to reach 14.3pc by 2022. It is currently 11.5pc. Investors sent shares up 1pc to ?2.99 in the early trade. The challenges facing Britain’s DIY chains was laid bare last month when rival retailer Homebase was hit by a 15.4pc fall in first quarter like-for-like sales. Homebase was snapped up by Wesfarmers for ?340m in 2016, but the group is now eyeing an exit after a lukewarm response from customers to its overhaul plans.